The vice president of design and marketing at Landscape Forms calls on the outdoor-furniture industry to build the collaborations that will shape the metropolitan experiences of tomorrow. All of us treasure our time in outdoor spaces. So why do we devote so little of our attention to their design? As a designer in the site-furniture industry, I am always curious about the value people place on the outdoors. I like to ask people I meet to describe a great city like New York, Chicago, or Paris and what they most remember about being there. Or I ask them, if they won $25,000 to spend on a dream vacation, where they would go and what they would do. Their fond memories of a celebrated city or an escape into the wild often have little in common, except for one thing: Their most memorable and meaningful experiences almost always revolve around the outdoors. We have studies showing that people tend to be healthier and happier, and can enjoy longer lives, in areas where they have access to nature, including green urban spaces. Outdoor spaces are some of the least expensive to create and can pay some of the highest returns on investment—in terms of community life, health and wellness, and the generation of economic activity in surrounding areas. As more people—from young professionals to retirees—move back into cities, green public spaces and vibrant streetscapes are often cited as key factors for attracting residents and businesses. Despite this, we do not give outdoor spaces the same value and financial support that we give to buildings and interiors. We calculate the square-foot dollar value of buildings and interiors but don’t do the same for a square foot outdoors. We have not made a strong business case for designed outdoor spaces—we can and should be making this case. I also believe that design and innovation in public and privately owned outdoor space is lagging—and the first step to address that challenge is to better leverage the skills and talents of landscape architects, the professionals best prepared to design them. In collaboration with landscape architects and other design professionals, all of us in the site-furniture industry can elevate awareness and promote greater investment in outdoor spaces that create memory and meaning. This is a time in human history when landscape architecture has something really important to say. We should listen. Landscape architects practice a discipline rooted in holistic thinking. They understand the natural environment, the built environment, and the interface between them. And they are ideally prepared to take leadership in shaping outdoor spaces and framing public awareness about them. Recent high-profile projects such as the High Line and Millennium Park have achieved placemaking of the highest order, and the star landscape architects responsible for them have captured public attention. But there is a whole legion of talented, inspired landscape architects out there who should also be at the center of envisioning and designing outdoor space. This is also a time when industry can play a constructive role. Those of us who provide the site elements that help shape and activate these spaces need to do our part, and I’m excited about taking on that challenge, researching methods to make the case for the return on investment for well-designed outdoor spaces measured in terms of community, identity, well-being, environment, and dollars spent. I am focused on driving innovation with new types of scalable solutions that go beyond the standard litter bin, bike rack, and bench, to help people enjoy great outdoor experiences. The outdoors starts only a half-inch outside the door, so we need new ideas for spaces adjacent to buildings. We also need to integrate technology in public spaces, but in ways that respect the special qualities of the environment. I am excited by the work and believe that, in collaboration with landscape architects and other design professionals, all of us in the site-furniture industry can elevate awareness and promote greater investment in outdoor spaces that create memory and meaning. We can make a real difference in the urban landscape that is our future. Kirt Martin is the vice president of design and marketing at Landscape Forms, leading the company’s creative teams for product development, marketing, and marketing communications. Martin is an award-winning industrial designer, and previously directed design activities at Turnstone, a division of Steelcase. “With the emergence of distributed forms of information the central role of the library as a repository of facts and information is changing. While it is still important to have this kind of resource, it has proven to be a diminishing draw in terms of library traffic. The notion of becoming a cultural center is an expansive role for the future library. It will not only serve as an information resource, but much more, with the exact mission and goals evolving and changing over time. Original article with more info. The good and the bad of all these new flexible ride services. We are on the cusp of widespread microtransit. Cusp may be too cautious. CityLab readers can surely name a bunch of these flexible new transit services without batting an eye. Commuter buses like Leap Transit or Chariot in San Francisco or Bridj in Boston (and now Washington). Dynamic vanpools like Via in New York. Carpool start-ups like Carma. True cab-share options like UberPool (now claiming millions of trips) or LyftLine (now with fixed-point pick-ups). Company and housing shuttles like the Google bus belong in the mix, too. What you might not appreciate is just how crowded this microtransit space has become. The start-up platform Angel List’s “public transportation” page, currently with 177 projects, seems to grow daily. Its general “transportation” page lists more than 1,000 ventures, and some services like Uber that insist on being labeled “technology.” Plenty of local entrepreneurs don’t bother with the list at all (like a new Omaha bar shuttle). One company, TransLoc, is even building an entire flex-transit platform to help public agencies to join the fray. Strictly speaking, there’s nothing new about microtransit. 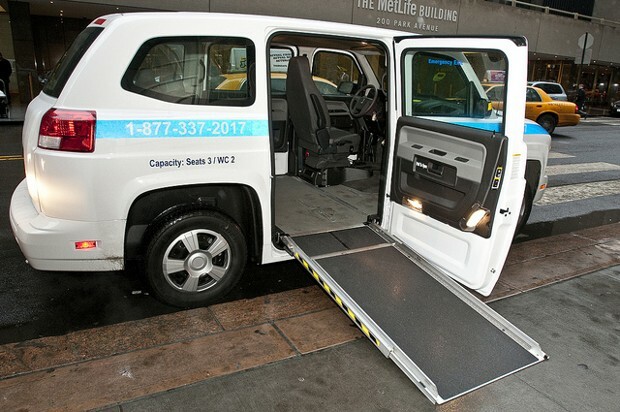 Informal ride-sharing networks like New York’s dollar vans have operated for years, while city agencies run paratransit services for people with disabilities (often at a great loss). But better data on mobility patterns and wide smartphone access have made flexible, on-demand transit more possible than ever. Social trends toward city living and away from car-ownership have also fanned the current flame. So something is happening here. Much of it seems good for city dwellers: you’ll get new travel options and the chance at a car-free lifestyle far, far quicker than if you waited for officials to build new transit networks or beef up density. But bad outcomes also loom, including the possibility that traditional transit service, traffic congestion, and low-income riders will all suffer. We took a closer look at the good and the bad of a microtransit future, and how cities can hope to contain it. An integrated system. In an ideal world, microtransit providers would become the feeders to public transportation’s core routes. They’d address what experts call the “first-mile, last-mile” problem—that gap at the start and end of every trip that’s difficult for traditional transit operators to serve in a cost-effective way. Coverage to low-density corridors or remote neighborhoods becomes very doable. A car-free lifestyle becomes that much more viable. Consider this: You wake up and e-hail a microtransit pick-up from your home or apartment. Maybe you pay a lot and get scooped at the front door, maybe you pay a little less and walk a block or two to a fixed stop. The shuttle or van takes you and some others to core public transit routes—a bus or train line that can run with super-frequency now that agencies don’t need to bother with feeder routes. At the end of the line you connect to another flex ride and arrive. Arthur Guzzetti, vice president of policy for the American Public Transportation Association, sees encouraging signs of such cooperation. Take Bridj. Initially positioned as a transit competitor, it has now made partnering with cities a priority. 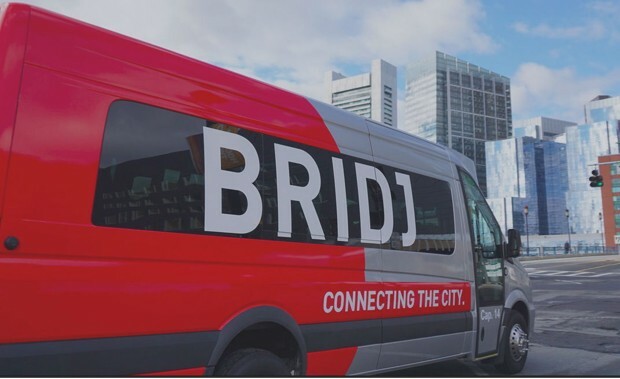 Guzzetti says Bridj is just one of a “a number” of microtransit services that have joined APTA as a member and come to the discussion table with traditional agencies. More transit riders. If micro- and public transit do function as an integrated system, the result should be less car traffic on the road and more fares for trains and buses. That revenue should lead to better service, which in turn generates more riders. Research from Berkeley’s Shaheen has found that people who use shared mobility systems own significantly fewer vehicles than other households; many own none. These numbers center on car-sharing services, which don’t quite fall under the microtransit umbrella, but are related insofar as both types of users may prefer a car-free lifestyle. In one survey of on-demand riders closer to microtransit’s core mission, 40 percent said they’d reduced their driving since using such service. Niche service. Private microtransit outfits can target certain niche populations in a way public agencies with a mandate to serve as much of the public as possible cannot. In cases where traditional buses or trains would have struggled to meet this demand, reaching these subsets creates a de facto expansion of the city’s transit network. At its best, niche service can span income classes and areas. Unlike some public agencies, microtransit companies can access remote immigrant enclaves, or provide enhanced comfort and convenience to well-to-do workers, or use technology to match like-minded riders from the same college campus. These “affinity” groups, as researchers often call them, reflect a pattern that shows up time and again in transportation research: some people prefer to share a ride with others like themselves. New transit competition. An integrated transit system with public agencies as a core and microtransit as a feeder might be the urban ideal, but whether profit-minded private companies would submit to such an arrangement is another question. One reason public transit agencies can’t reliably serve feeder routes in the first place is they tend to lose money. Asking microtransit companies to take that role might not harmonize with their business mission. If an integrated scenario doesn’t pan out, the flipside might be an ugly competitive one—with microtransit providers trying to poach bus and rail riders in key high-density corridors. That outcome would create a two-front fight for transit agencies. On one side they’d be battling for riders against private services with potentially greater resources. On the other, as fare revenue eroded, they’d be battling public officials for more funding to stay afloat. Perhaps cities would adapt by creating some flexible, middle-tier services of their own (that’s certainly TransLoc’s bet). There’s also a reverse scenario where microtransit takes the core routes and public agencies take the feeders (though that would require even greater public funding). But barring such outcomes, transit quality could suffer—especially for the hard-to-serve (read: less profitable) areas often home to disadvantaged residents. More mileage and congestion. Less personal car reliance is one of the great potential benefits of microtransit—with social gains for everyone in terms of public health, productivity, and road safety. But those gains are lost if flexible ride services generate new road mileage themselves. A not-so-hypothetical: Two people who used to drive alone into work give up their car commutes and now share a microtransit ride into the office. Let’s say each drive was 3 miles. On the commute alone, the shared ride saves some driving: instead of 6 total miles, it’s down to the basic 3 plus maybe a half mile to pick up the other rider. But if that vehicle has to drive all the way back after the trip to get a new fare, or if it wasn’t going to be on the road in the first place, it’s not hard to see the total new mileage exceeding the old one, even with fewer cars on the road. For what it’s worth, computer models of shared vehicle systems have found just that. In one study of Austin, each car in a shared network was found to replace 11 private cars, but still increased vehicle mileage 10 percent. And that was with optimal, driverless cars—human drivers will be far less efficient. These unintended outcomes can have a more local impact on traffic, too. Take the private shuttles that carry commuters from apartment buildings on the west side of Midtown Manhattan, where there’s poor subway access, to the trains at Columbus Circle. The traffic produced by these vans or mini-buses is much less than if all the riders drove, of course, but there’s still a frightful amount of new daily congestion at the curb where these shuttles fight for space to drop off passengers. Exclusivity. Targeting underserved or unrecognized niche populations can be a good thing for both a business and mobility at large. But taken too far in the service of a brand or profit, this specialty practice can drift into the sort of exclusivity that violates public transit’s equity mission. Take the recent news about San Francisco’s luxe Leap Transit service, which according to SFist exchanged wheelchair accessibility on its buses for “bar seating and leather armchairs.” Whether or not that’s true, it’s easy to imagine the clientele on flex-luxury buses deeming certain types of riders often found on public transit undesirable, and hoping the service avoids them. One west side company shuttle was denied its own curb stop because it refused to pick up other members of the public waiting there. Morality aside, such exclusivity represents a failure of private microtransit to recognize that city streets and curbs are civic spaces that must be managed in the public interest. 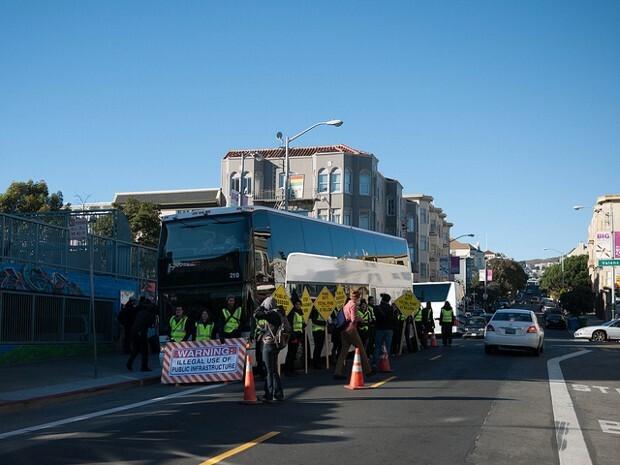 These practices could also create problems in the event that cities did partner with microtransit providers in some sort of integrated system, since public agencies have a legal obligation not to discriminate among riders. The longer cities wait to address the rise of microtransit, the harder it becomes to implement the type of coordination or regulation key to any strong mobility network. (See: Uber.) Guzzetti expects flexible transit companies to join the conversation and says he would “question” any services that didn’t want to operate as part of a system. Nelson\Nygaard’s Supawanich sees hope for “some public entity that’s the clearinghouse or the coordinator” for local rides—perhaps modeled on an oversight body in Denmark that already exists for such a purpose. Under this system, a central dispatcher of sorts would receive trip requests and assign certain vendors to the job. Maybe there’s enough demand in one location for a private flex bus. Maybe there’s a corridor of riders fit for a private cab-share. Maybe there’s a service disruption that calls for a traditional public 40-foot bus to make a route change. That type of strong oversight might not go over as well with private companies in the United States. Another option, says Columbia’s David King, is to charge microtransit companies for the curb space they congest while awaiting new fares or making drop-offs and pick-ups—similar to what San Francisco did with the private Google buses that were using public Muni bus stops. Such fees should serve to price out excess traffic and whittle the microtransit market to the most efficient options. Yet another option, says King, is for city agencies to arrange strategic partnerships with microtransit providers for service that’s both in the public interest and traditionally tough to supply. A flex company could serve a new apartment complex or office park that’s trying to meet its alternative transport goals. The city gets fewer cars on the road and less congestion, and the company might receive some regulatory leeway, a steady revenue stream, and public favor. A few such arrangements have started to emerge, such as a recent partnership between Dallas’s DART agency and Uber to provide a drunk-driving alternative on St. Patrick’s Day. But in general, says Shaheen, neither the public nor the private sides seem to be approaching the situation as a pressing issue. To her, that’s a sign that few people have yet to realize just how radical the microtransit movement might become. “How can there be sense of urgency if people don’t really perceive that what’s happening here is potentially transformational?” she says. With its superfast broadband, the city has reinvented itself. Now it must safeguard its future by building to sustain that growth. Chattanooga gets a lot of press thanks to its smart-grid Internet. Both The New York Times and The Guardian ran affectionate spreads of “Gig City” this past year. Both mentioned that Chattanooga residents can download a two-hour movie in under a minute. And both mentioned that the city’s economy has been revolutionized as Chattanooga emerges as a destination for tech-driven innovation. But there are other valuable infrastructure lessons being hashed out in Tennessee’s fourth-largest city. Chattanooga is aiming to build on the reputation it’s earned from its world-class broadband service. The goal is to make the city a sustainable innovation hub, showing that it’s a well-rounded city rather than a one-trick pony. Evidence of this forward-thinking strategy can be seen in an ambitious expansion of housing downtown—known locally as the City Center—which is aimed at attracting young professionals that value walkable urban cores. The goal is to make the city a sustainable innovation hub, showing that it’s a well-rounded city rather than a one-trick pony. The latest downtown housing effort began in 2013, three years after the city’s gigabit Internet was first introduced. The community was of course enthused by the changes they were seeing in the city. But to local policymakers, the level of housing density in downtown Chattanooga was far from ideal. Over 50,000 people showed up to work there each day, but a dearth of adequate housing prevented many of them from moving there. Over the course of several months, more than 70 local stakeholders came together to identify 22 downtown buildings that needed to be remodeled (some razed) to make room for new housing. “We knew we had to get some things together to really catalyze development in this area,” says Amy Donahue of River City Company, a nonprofit development group that led the effort. Most of the properties they targeted were vacant and antiquated. Still, their value was clear: Most were within walkable distance to the local public university and surrounding restaurants and coffee shops. And the picturesque Tennessee River was right around the corner. Also, many were revered hotels and office buildings that told the history of the city—relics from an industrial-boom after WWII. In total, 1,260 new housing units were planned to occupy the fallow buildings. A year and a half later, Chattanooga’s urban core is showing signs of a more vibrant residential area. Already, 11 out of 22 buildings have been redeveloped or are in the process of being redeveloped, according to Donahue. Why have the structures flipped so quickly? One reason is that tech-focused venture capital firms have been getting into the mix—recognizing that downtown housing goes hand in hand with start-up activity. Chattanooga won a second shot at life with its revolutionary Internet service. And it hasn’t sat on its winnings. 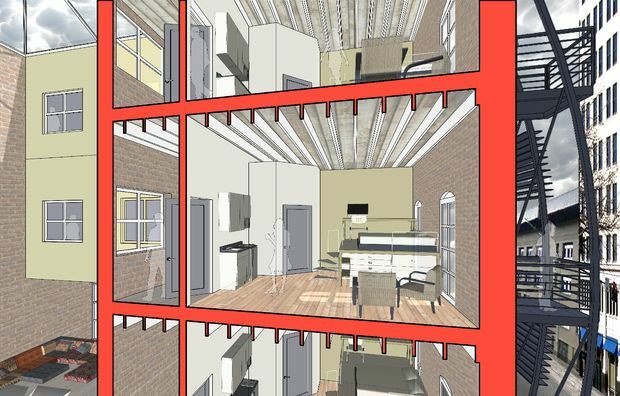 Of the most recent proposals is a 43-unit microhousing project. 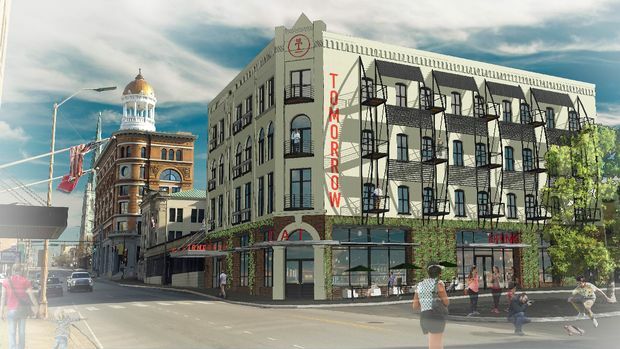 The units will be built in a former hotel dating back to 1888, and will feature 300-400 square foot co-living spaces that are expected to cost roughly $850 per month to rent. Named the Tomorrow Building, the project is led by the Lamp Post Group, a well-known local venture capital firm that finances a number of Chattanooga-based startups. Joda Thongnopnua, Lamp Post’s communications director, says he sees the project bringing a variety of changes to downtown. Best case scenario: Entrepreneurs from other tech hubs relocate to Chattanooga. In turn, more and better start-up activity takes off. But equally importantly will be the project’s sidewalk-level retail. These types of social spots that accompany new housing, Thongnopnua says, is what will densify the city. A denser downtown may prove to be more important to Chattanooga’s tech scene than the speed of its Internet. 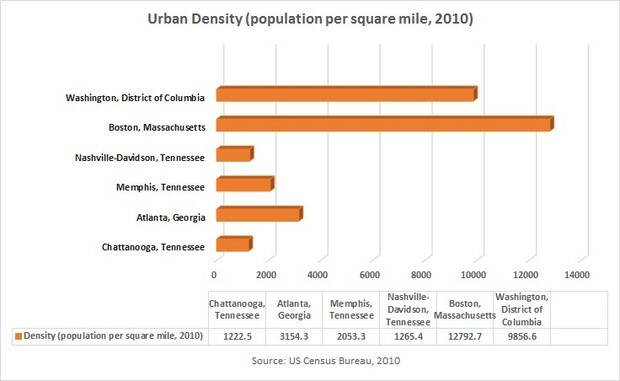 A 2014 study by Brookings’ Metropolitan Policy Program concluded that density “enhances innovation.” Yet, compared to rival and aspirational start-up cities, Chattanooga lags behind in urban density. That was made even clearer by a Federal Communications Commission ruling last week. The decision struck down regulations—in Tennessee and North Carolina—that largely prevent publicly owned broadband services from expanding. That’s not entirely bad news for Chattanooga—for now. If the FCC ruling isn’t shot down by an appellate court, according to reports, Chattanooga will have the right to offer its fiber Internet to new municipalities. But if Chattanooga-style Internet sweeps across the country, implies David Dayen of The New Republic, Chattanooga will look a lot less special. “The ruling has major implications for promoting competition, increasing broadband speeds, and perhaps even making broadband speeds look more like electricity,” he writes. But a city smart enough to build America’s best Internet infrastructure is smart enough to know that can’t be the end of its urban planning. Chattanooga essentially won a second shot at life with its revolutionary Internet service. And it hasn’t simply sat on its winnings. Chattanooga’s future will hinge on a broad range of infrastructure investment rather than simply its Internet—and that’s a sustainable future. Oxnard Blvd as AN URBAN RESIDENTIAL COMPLETE STREETS CORRIDOR from the 101 to Pleasant Valley Road. In addition the new Blvd will be a tree lined pedestrian and bicycle friendly model of a walkable community the entire length of the new urban corridor, in other words Oxnard Blvd will become a Complete Street. Transportation planners – listen up – as a society we are moving towards more public transportation and much smaller vehicles and away from wide auto dominated speedways that destroy a livable walkable urban landscape. The new Blvd will have the look and feel of a more urban space with pocket parks and other civic amenities (public art and more) along the spine. This is not a rigid idea – it’s an idea with lots of flexibility built in. Many variations and permutations within the basic theme of housing and retail concentrated along a walkable urban corridor. Each block along the current corridor is different, suggesting and evoking variations on the general theme of an urban residential street. It is expected that Ventura County, a very desirable and attractive – if less well known area, will experience a strong demand for housing going into the future. This project location will link the LA area via Santa Monica and Malibu to all points north, starting here in Ventura County, onto Santa Barbara County, with Central California and points north. The mix of housing types will, in part, be aimed at Millennials and other savvy urban seeking young people and tech workers. Creative development options, like those proposed here, reduces the pressure to sprawl with its detrimental effects on cities – and enhances our quality of life. Oxnard has a historic district that may not want a downtown with all the hustle and bustle to encroach into the area. With this plan Oxnard downtown remains A, B, and C streets. There are a number of historic business and buildings along the corridor. These entities must be respected and integrated into the fabric of this plan. The Blvd will provide auto, bus, and perhaps other (innovative) access from Pleasant Valley to the 101 via this route. However, the Oxnard downtown area (A, B, and C streets) from 1st or 2nd streets to 8th or 9th streets will have streets designed in such a way as to connect the downtown with the Blvd, and perhaps a walking link from the downtown to the Blvd at 2nd and or 6th street. Many ideas have been proposed for a vital downtown Oxnard and upgraded Blvd, but I am not aware of anyone suggesting this concept. As I think about it this it’s not so much about downtown as it is about creating an urban residential corridor on the Blvd. 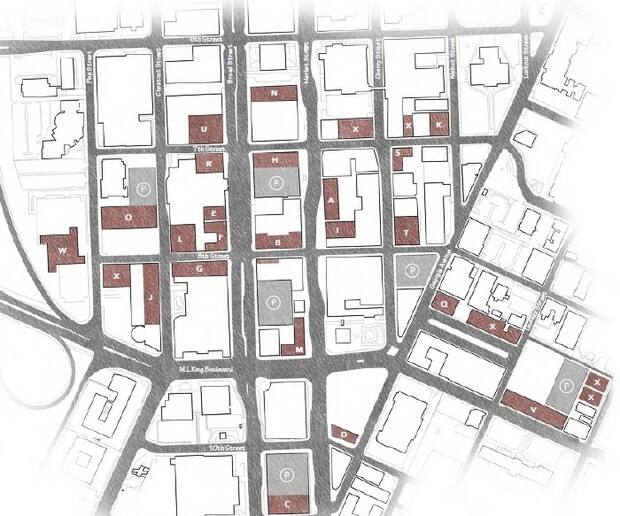 A few nodes of “neighborhood centers” along the spine of housing will develop – which I perceive as a good thing, as well as helping our current downtown grow in the future. All too often parking is the form generator for cities. Clearly this is not a good way to plan for the future. The residential structures I am proposing for the Oxnard Blvd Urban Residential Corridor may have parking at the street level behind retail and perhaps on the second floor with residential above. 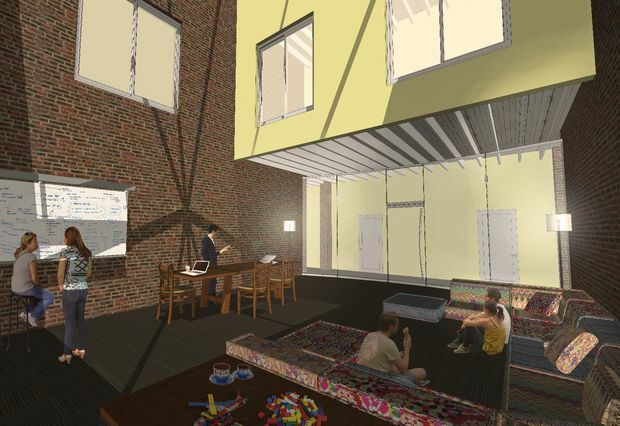 This second floor parking might (will) be designed so it can be easily converted into residential or office space as we advance further into a world where we use public transportation and bicycles more and cars less. Also with appropriate public transportation, perhaps we plan for one parking space in the residential structure and another in a easily accessible parking structure near by. Or a credit of some kind is given for only one parking space. Currently Oxnard Blvd has a shabby look with empty lots and the remnants of auto dealers, strip malls, and other old worn out buildings lining a rundown road. The above ideas have the potential to make Oxnard Blvd and the City of Oxnard a leader in transportation planning and housing innovation in Ventura County. While most of the ideas and concepts above are my own (of course they are in the public domain and have been used elsewhere), I did get feedback and refinement from other stakeholders in our community, and for this I am grateful. This is a new section on a Visionary Oxnard, and what we can, and need to do, to make Oxnard a place we can be proud of. If we do nothing we will get sprawl, which will bankrupt Oxnard. Jones Ranch and South Shore are examples of projects that will require new and very expensive infrastructure and at the same time divert energy and investment from the Oxnard core. In future posts we will go into more detail about how to make Oxnard a model and visionary sustainable city. The Partnership for Working Families has created two smart documents to help us sort out the mysteries of municipal trash services. Lots of great info to help us understand the ins and outs of urban trash and how we can make Oxnard a leader in talking trash. Oxnard did it with water – now we have a great opportunity to tackle trash. (Re)Building Downtown: A Guidebook for Revitalization is a resource for local elected officials who want to re-invigorate and strengthen neighborhood centers of economy, culture, and history through a smart growth approach to development. The current path cities are pursuing is not financially stable. The future for most cities will not resemble the recent past. The main determinant of future prosperity for cities will be local leaders’ ability to transform their communities. The SmartCode differs from some other form-based codes in that its community-scale and block-scale articles are written explicitly for zoning. Zoning reform is essential to allow walkable mixed-use neighborhoods, thereby combatting sprawl, preserving open lands, and reducing energy use and carbon emissions. Looking to curb sprawl with a form-based alternative to conventional zoning? No need to reinvent the wheel. The SmartCode is a model ordinance that’s customized to reflect local context, character and goals. And best of all, it’s open source and free. You Think You Know About Parking? A brief and urban look at the way a street engineer can make our streets walkable. The street engineer that pulls out the code book and tells you, with various official sounding citations, that making streets only for cars is the only thing that can be done – is regressive and does not understand where cities are going. We need street engineers that understand walkability, urbanism and placemaking. The code based street engineer is a dinosaur. Report focuses on hardscape only. No recognition or acknowledgement that sidewalks are for people who walk or for place making. Thus no understanding that investment and economic development follow places where people like to gather and walk. The 1996 plan prepared for the Oxnard Community Development Commission by the following firms: Civitas, Andres Duany and Elizabeth Plater-Zyberk, the Gibbs Planning Group, and Curtis Stiles, A.S.L.A. Why Do Cyclists Break the Rules? "...many of the critical uses of streets have been partly or wholly removed from the urban streets designed by traffic engineers. Walking, biking, transit use, and public life often all but vanish when traffic engineers impose a narrow view of what a street should accomplish." “...high-growth firms cluster in both urban centers and suburban areas that are dense, diverse, walkable, vibrant, and served by transit. Simply put, it is the vibrancy of a neighborhood—not whether it’s urban or suburban—that attracts high-growth firms and helps bolster a high-growth regional economy." Speak UP! WHAT DO YOU THINK ABOUT OXNARD BLVD? Take our poll. What's your vision for Oxnard Blvd and Housing in Oxnard? When car ownership goes away - what happens to all that required parking? What Are Trees Worth to Cities?